During this semester I have learned many things that I will carry with me through my remaining time in school and the throughout my teaching career. I made the infograph below to help remind me of three of the most important things that I have taken away from my schools and society class. The three key themes I have found to be most important to me are equitability, bullying, and ideal teaching environments. These are three things that I feel are important for anyone in the teaching field to think about and remember because they are what is best for the students. The first key theme I think is important is equitability. Just like a lot of people I did not understand the difference between equitable and equal before doing some research and learning about both in this class. While it is a common goal to offer equal education to everyone, equal education does not always mean that everyone is getting the same instruction, assistance,treatment, or funding. With equity in education students are given the same opportunities and their is more fairness involved. This is very important to me because when working with students with disabilities there is much need for equitability. The largest problem that schools run into when it comes to the education being equitable is not having all the resources. Sadly the education system is set up in away that a school who has the most advantages for equitability are the schools that do not need it as badly, and the schools with the least advantages are the ones who need the equitability. I am willing to work very hard for my students so that they can have the same opportunities as every other student in the school, even if that means they need more support and assistance along the way. The next thing discussed in this course that I feel is important is bullying. We watch a documentary about bullying in class. In the film there was a boy named Alex who was being bullied badly, he was somewhat aware that we was being bullied but because of his diagnosis of aspergers he was not completely aware and did not know how to properly react to the situation. The filmed showed how badly he was bullied throughout the year and how administration, teachers, and even bus drivers ignored this fact. When the film crew decided it had gone to far they showed Alex’s parents the footage. Alex’s parents were disgusted by the footage and went to the principle of the school. The principle ensured the parents the something would be done and that they would talk to the student who were bullying Alex. However, the bullying did not stop. Also in the film there were several families of students who had taken their lives due to being bullied so badly. I personally was bullied, the bullying was mostly verbal, in school and when I went to a teacher I felt comfortable talking to he tried to help me by talking to the administration. However much like Alex’s case nothing was done and the bullying continued to a point where I had to leave the school to try to get away from it. I never want a student to be put in alex’s or my situation in school. I plan on creating a safe place for my student where they feel comfortable talking to me about bullying as well as having an effective plan with my administration encase of bullying. While the bullied is very important in bullying situatuins , we need to remember that the individual bullying may need our help as well. Many bullies are struggling with deeper issue that we may not know about as well as having struggles at home or a bully who is bullying them. We need to remember to supply support for everyone involved in the bullying situation in order to stop and prevent bullying. The final and most important thing that I have taken away from this course is that my ideal teaching environment is something that can be achieved. While I may not be able to have every physical aspect of my ideal classroom, such as large floor to ceiling windows, a tree growing through the middle of classroom, and ipads for every student, I can and will be able to create and provide the atmosphere and environment that I want. I will be able to provide a safe place for my student, a calm and inspiring atmosphere, a place of acceptance. I want to make sure I can provide a place where my students are free to question things, and learn not only what I teach them but also things they are interested in. I will also ensure that I have lessons that involve multiple learning styles of my students. With an environment that supports all my students I can give them the best education possible. Throughout this course I have learned many things. While each of them are equally as important the three that stand out to me the most were equitability, bullying, and my ideal learning environment. I am now feeling more confident as a teacher. As well as having an idea of where and how I want to teach. The infograph below is something I will hang in my future classroom to remind me of these important topics covered in this class so that I will remember to provide the best learning environment for my students. Barrett, L. (2013). Seamless Teaching: Navigating the Inclusion Spectrum. Teaching Tolerance, 52(43), 53-55. Biddle, B. J., & Berliner, D. C. (2002). Unequal School Funding in the United States. Educational Leadership, 59(8), 48-59. Goldstein, D. (2014). The Teacher Wars: A History of America’s Most Embattled Profession. Doubleday. Leys, Tony. “Boy Has New Life after ‘Bully'” Boy Has New Life after ‘Bully’USA Today, 2012. Web. <http://archive.desmoinesregister.com/article/20120521/NEWS/30521002 7/Boy-has-new-life-after-Bully->. This week’s compelling question proposed by my teacher is what is worth teaching. Schools are now very focused on text books, standardized testing, district mapping, and standards that this has now been the main focus in curriculum. As a teacher there are things we are expected to teach to provide our students with the required information that is given in the TEKS and to help them do their best on state required standardized test. However, we are not limited to just teaching just that information and we are not limited to one teaching style. As teachers we are responsible for teaching our students important information to help them succeed in life and to help them gain information on different topics to help them discover their interests. To do this we need to go beyond the minimum requirements when teaching. We also need to make sure we present the information in away that is interactive and interesting to the students because then everything can be worth learning for them. I am studying to be a special education teacher so I feel as if there is a lot of things that are worth teaching my future students that are not included in the TEKS or on the STAAR test. I think with using the right resources there are many ways to incorporates any of these things into lessons so that they can be beneficial to my students in more than one way. One thing I feel is very important for individuals with disabilities to learn is how to apply all their skills learn in school to real life. Such as math for grocery shopping, ordering food, paying bills and other things. Also learning to use public transportation. All these thing can be incorporated into other lessons and used as field trips. Equity is about having fairness and making sure everyone has an equal opportunity. 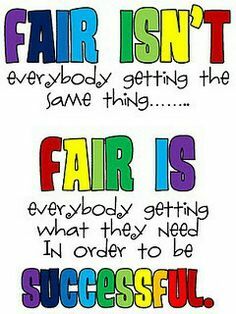 Being fair is about everyone having the resources they need to be comfortable and successful. For schools to be more equitable I think teachers and administrators have to see the needs of their students and help the students get to a point where they feel like they are being treated fair and given equal opportunities to succeed, along with feel supported by their peers, teachers, and administration. Our schools are required to have equity for students, however schools define it as equality. While this is not a bad thing, equality does not always give everyone or every school equal funds, instruction, or treatment. Unfortunately the individuals and schools who receive the most advantages are the ones that are not usually in need of the assistance. I think that for schools to be more equitable there needs to be a lot of people wanting to commit to changing schools and the school system. Right now school funding is not equitable. Without fair funding school suffer from not being able to offer resources for their students. Resources are needed to help make schools more equitable for students because things like tutoring, counseling, and other supports for student help them be able to succeed. While funding plays a large role in it all, I think another thing that would help schools be more equitable would be more support from teachers and school being a safe place for students.